The 2013 Ohio State ATI Dairy Cattle Judging Team put in a great showing this fall. The team participated in contests at World Dairy Expo (Madison, WI – September 30), the Pennsylvania All-American Dairy Show (Harrisburg, PA – September 9), and the North American International Livestock Exposition (Louisville, KY - November 3). Team members are Laura Bond, Dan Grim, Marshall Overholt, and Meghan Thurston. The contest at World Dairy Expo is considered the “national contest” for 2-year colleges and other similar post-secondary institutions. 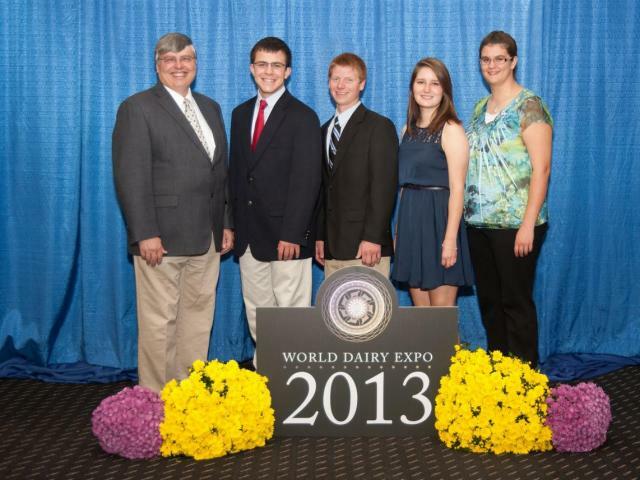 As a result of placing as one of the top three teams at World Dairy Expo, the team has received an invitation to participate in the International Dairy Judging Tour with competitions in Scotland and Ireland from June 18 to July 2, 2014. The team placed 4th overall in the Pennsylvania All-American Contest. At the North American International Livestock Exposition, the team placed 2nd overall. "Interestingly, all the top six teams in this contest competed in the three contests that the Ohio State Judging team participated in this year – with all six placing in the top six at each of the three contests," said judging team coach Royce Thornton. "in other words, the Ohio State ATI team defeated every team at least once (sometimes twice) during the judging season except the team from Kaskaskia College." The judging team is in the process of raising money to fund their international judging tour. "Contributions to support their participation tour are appreciated," Thornton said. Persons interested in contributing can contact Thornton via e-mail.